Unlikely to be the last Trump? New Zealand lacks any class action regime, which is an exception to most other common law jurisdictions. Between 2006 and 2008, The Rules Committee investigated the possible introduction of legislation necessary to create a functional class action regime. During November 2009, the Ministry of Justice produced a ministerial briefing paper recommending that steps be taken to obtain approval to issue formal instructions for drafting a Class Actions Bill. To date, no drafting instructions have been issued. This article suggests that representative actions can never be a substitute for class action litigation. Judicial inconsistencies associated with representative actions, while they do undermine the benefits of group litigation, do not on their own justify the introduction of class action legislation. Rather, legislation is necessary because representative actions cannot in all cases be used to achieve the objectives of aggregate litigation. This article critiques aspects of The Rules Committee’s Draft Bill based on both the Canadian and Australian experience with their respective class actions regimes. This article explores whether constrained judicial discretion is impeding access to justice. It considers the rationale, origin and development of security for costs within Australia. It examines the approaches taken by judicial authorities when exercising their “discretion” to order security for costs against corporate plaintiffs. The empirical research analyses security for costs applications over the period 1991 to 2013 in the federal jurisdiction to prove that while the judiciary applies the KP Cable guidelines when determining security for costs applications, there is disproportionate weight given to the impecuniosity of the corporate plaintiff. It scrutinises how many of the cases resulted in security for costs orders; the weight given to each of the guidelines; and whether the inclusion of s 1335 of the Corporations Act has affected the judicial approach. It concludes that the legislation should be amended to codify the guidelines and specify that they be afforded equal weight. 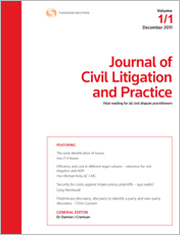 For the PDF version of the table of contents, click here: JCivLP Vol 5 No 1 Contents.